ClickySticky Christmas by Invocore gives children the chance to make great-looking Christmas scenes and print them out or email them to friends and loved ones. Though there are only four backdrops from which to choose, ClickySticky Christmas provides plenty of entertainment for the price. And with its easy-to-use interface and ample amount of virtual stickers, it’s also an app that will keep your little one busy for hours. 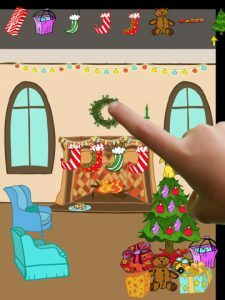 In ClickySticky Christmas, you’ll begin by choosing from one of the four backdrops; two interior scenes, two exterior. To pick your stickers, simply scroll through the menu at the top of the screen and choose from a number of holiday-themed stickers. These include Christmas lights, snowballs, reindeer, Santa, and dozens more. You can place these images, flip them, and shrink and expand. And by holding two fingers on the object and turning (like a protractor), you can rotate the images as well. Depending on your child’s age, they may need help with some of these actions as some of them can be rather touchy. For example, there were many times when my three year-old tried to resize an object only to have it immediately shrink to its smallest size or blow up to its largest. It seems resizing takes a bit of finesse. Once you have an scene you’re happy with, simply pull up the master menu and you’ll be able to save or email your image. Emailing, of course, will allow you to print it out from your computer, making ClickySticky Christmas a great tool for kids wanting to create their own Christmas cards. Again, the interface it simple enough for little ones to use, though most will need help from an adult to use the email tool. 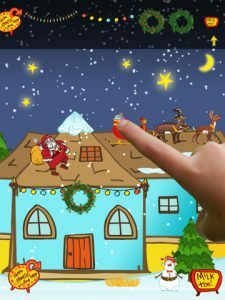 Bottom Line: ClickySticky Christmas is not just a great app for kids who just want to play around and create Christmas-themed pictures, but also for creating their own Christmas cards. 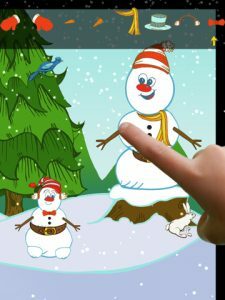 The interface can be a bit touchy, but most kids will have no problem using this fun little app. 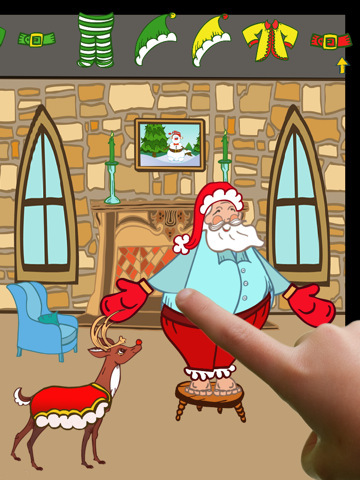 ClickySticky Christmas is compatible with iPad. Requires iOS 3.2 or later.